Maggie put together a Runner Photo Challenge, and I'm really excited to participate! She wants us all to share a photo of memorabilia from our favorite race. I saw that Kim enlisted her cat to model, so I made Napoleon follow suit. He was displeased by his new station in life. 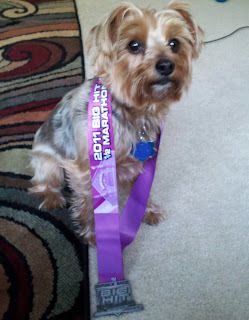 After several treats, we got a keeper photo of the medal from the Big Hit Half Marathon, which I ran last fall with Rachael. This was a meaningful and fun race, with Rachael and I enjoyed a ton of delicious food on our little road trip to Louisville. At this race, I proved to myself that I am a runner. I followed a training plan, I fought through the pain and I met my goal. No one else could have done the work for me. I earned this medal, and I wore it all day. Now it hangs on my homemade medal hanger on my ego wall, where I'll be adding my triathlon medal later next month, my marathon medal later this summer and, eventually, my Ironman medal. Napoleon will have a long and fruitful modeling career, whether he likes it or not. Unrelated: we're out of dog biscuits. LOL! Napoleon will have a long career! I visited Louisville for work a few times last year. I enjoyed running there and think it would be fun to do a race there! I love the reasoning behind why you chose this medal! Did I Capture a Ghost?